One of the consistent traits among clients at The Accelerator is a drive to solve problems and fill a void in the market. 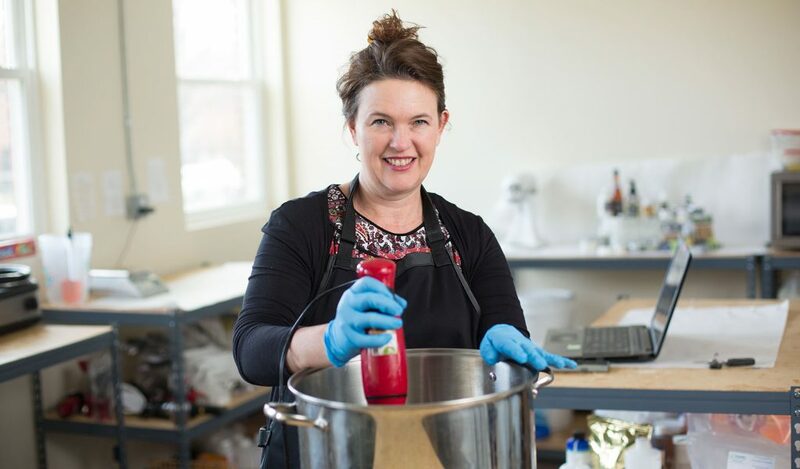 Cindy Allyn turned her own need of wholesome skincare products into a company called Farmbody Skin Care, and the company is rapidly gaining momentum in the Hudson Valley. Soon, however, she wanted to start helping others as well. Allyn, who still works a few days a week at an organic nail salon but is working on transitioning full-time to Farmbody, had nail clients who had a variety of health conditions that made skincare difficult. The first product she designed for others was an all-natural balm that was specifically meant for people going through cancer treatments. They would get very dry skin and splits in their fingers, and the skin would get thinned from radiation and chemotherapy. The balm was successful in reducing redness and splits. Allyn, who has two employees, has been making her skincare products for several years now, and continues to expand her product line because, as she says, she believes “there’s a better way” to get high-quality skincare than by using many of the mass-produced chemical-reliant products you’ll find on the market. Additionally, she is committed to supporting and working with local farmers and businesses. Many of the wineries and breweries like to have other products for sale that are commemorative of their brewery and give people something to purchase in their gift shops other than alcohol and T-shirts. Allyn has started making liquid soaps, shower gels, hand soaps, shampoos, conditioners, shaving soaps and aftershave with beer – a full line of grooming products. Allyn is also focused on working with local tattoo shops with her tattoo aftercare product. “There’s a definite need for tattoo aftercare, because no one in the area is making anything handcrafted that gives people that care they need,” she said. With every sale she gets, Allyn feels like she’s getting closer to her goal of making Farmbody Skin Care her full-time venture. Through The Accelerator, she has obtained access to resources she not only would not have had before, but never would have even known about. Of course, old-school sales tactics have also been helpful. With a partnership with the Accelerator, an admirable drive for success and a commitment to working and staying local, Allyn is looking forward to taking Farmbody Skin Care to new levels.